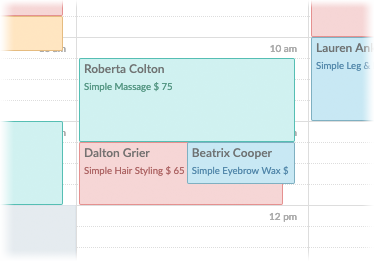 By default, Setmore won't allow you to schedule two or more appointments in the same time slot. To bypass this, you can activate double booking. Note: Only account admins may activate double booking. If you are a staff member, please contact your account owner to activate this feature. When scheduling an appointment in the Setmore mobile app, you'll notice that the app only shows available times that are not currently occupied by an appointment. By activating double-booking, you'll be able to schedule appointments anytime, regardless of whether there's already an appointment booked in that time slot. Scroll down to the Double Booking feature and tap the switch to turn it on. Now when you schedule an appointment, you'll be able to select an occupied time slot. Log into the Setmore web app at https://my.setmore.com to activate double booking. Next, click "Activate double booking" to activate the feature. You'll see a yellow pop-up message at the top of the browser window that confirms the activation. 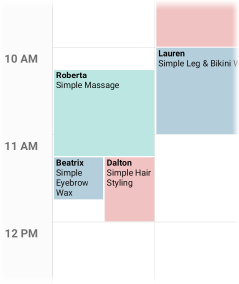 To book an appointment in an occupied time slot, simply click the open sliver of calendar space next to that appointment, and book the appointment as usual.